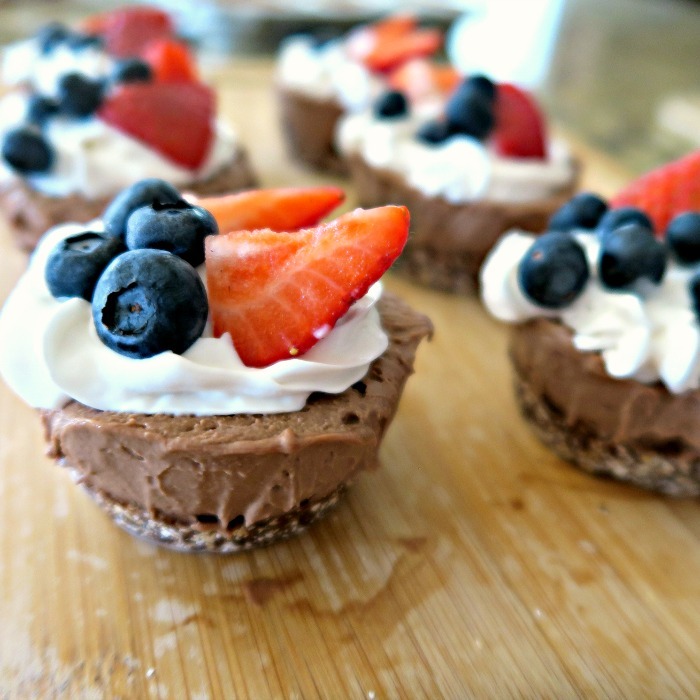 These are tasty all year round, but add red and blue berries and they’re perfect for the 4th of July! Check out the how-to video on SuperKids Nutrition Instagram page. If you have dried dates, soak in water for 10 minutes and drain before using. Blend dates in a food processor until it forms into a ball. Remove and set aside. Add oats, salt, and cocoa powder into the food processor and blend into a meal. Then add dates back in and blend until loose dough forms. It should stick together when gently squeezed. If it’s too dry, add a few more dates and if too wet, add more oats. Cut out parchment paper into circles the shape of your muffin tins or pan. Then, cut out two strips of parchment paper per circle and lay them in an “X” shape at the base of each muffin tin. Top with circle shape. This will make lifting each cheesecake out of the tin easier. Divide crust evenly and carefully press with fingers to distribute. Really press it down, allowing some crust to come up the sides. Let the crusts sit in fridge or freezer to firm up. Add all filling ingredients to a blender and mix until very smooth – up to 2-3 minutes. Add more maple syrup, agave, or coconut milk if it won’t come together as the liquid should help it blend. Scrape down sides as needed and blend until very creamy and smooth. Taste and adjust as needed. Pour filling evenly into the set crusts. Tap a few times to release any air bubbles, then cover loosely with plastic wrap and refrigerate about 4-6 hours or freeze 1-2 hours, depending on the size of your cheesecakes. Once set, run a butter knife around the edge of a cheesecake and gently remove by pulling the tabs upward. If they are set properly, they should pop right out. If not, pop them in the freezer for 15-20 minutes, and they should come out easily. 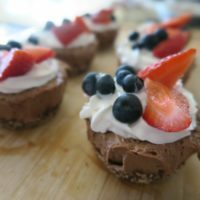 Top with whipped cream and fresh berries, or enjoy as is! See notes for storage. *These store well in the fridge for a few days, and in the freezer for up to a few weeks! These are perfect to bring to a party because they stay firm at room temperature for a couple of hours. *Recipe creates four medium-sized cheesecakes (made in ramekins), ~12 mini cheesecakes (made in muffin tins), or 1 large cheesecake (made in a round cake pan). *Loosely adapted from Minimalist Baker.